I made it very simple so that you can use it as it is or modify it easily in Excel or OpenOffice. Use it for verbs in French, Russian or in about any other language. If you look at the tabs in the bottom left corner, you will see that I put you there a version with five lines instead of six1, but also an example of modified sheets for Portuguese and for Romanian. Yes, I know, that's too much ! 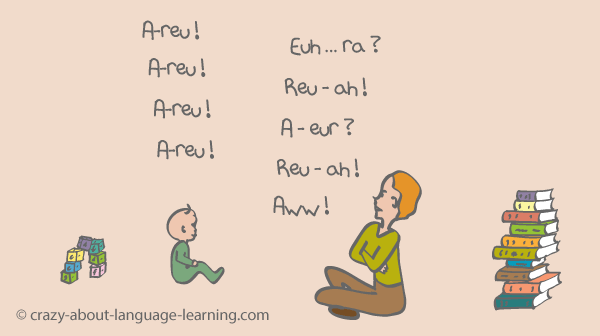 Even if they are always presented to us on the very first pages of the language methods, the verbs ‘to be' and ‘to have' are often irregular and thus, I think, not obligatorily the most urgent verbs to learn by heart. I advise you to rather start by learning two to three regular verbs. This way, you will immediately recognize where are the exceptions in other verbs, what diverges from the norm. Also, you can learn only one tense per day. To be learning little-step-by-little-step can reveal itself more effective than putting in long hours. Only learn five or six lines and you'll most probably try to remember them in the next hours, just for fun. By learning too much in one shot, you can put a stop to your desire to learn a language. You're never going to do that by learning just a few words. On the contrary, those few words are most probably going to joyfully pop up in your head along the day and repeating in one's head is a great way to memorize. #3. Help your memorization process out ! About the memorization process, a good tactic consists in trying to guess the conjugations before looking them up in your textbook or at Reverso translation. You are going to get it wrong or not remember, but it's a lesser evil to halt in mid-air in a learning situation than in a speaking one ! Another tactic consists in using your blank sheet as an exercice sheet. 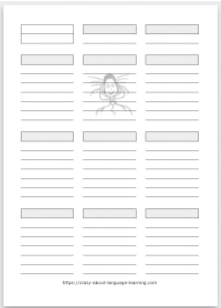 You print it and fill it out with a pencil without stopping or checking line after line if you're doing it all good. Only afterwards you check your answers and the ones you couldn't find. I only selected the tenses that seemed to me the most important and I put them in a logical order (my logic, yes). You can see that I didn't first put tenses of the indicative, then tenses of the subjunctive, then the conditional, etc. I used another order. – In Portuguese, the 1st person singular of the present of the indicative helps to form the present of the subjunctive. I thus put these two tenses one next to the other. – In the same way, the simple past of the indicative sets the tone for the preterite of the subjunctive. I thus also put those two tenses one next to the other and I added to them the preterite of the subjunctive on the same line for the following reason. In English, we say ‘If I were a dog, I would bark'. In Portuguese, we say ‘If I were a dog, I barked' (In fact, sorry but I couldn't translate well the first part of the sentence because the preterite of the subjunctive doesn't exist in English !) It's not that difficult though. 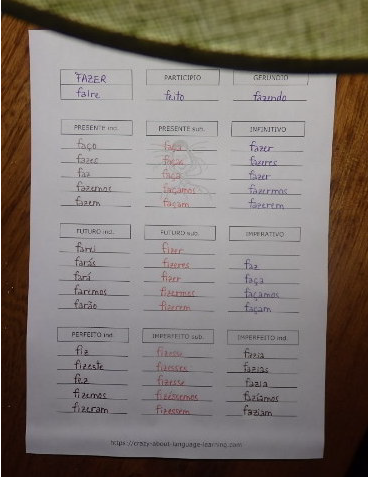 You just need to know it, practice a little and that's why, on my beautiful conjugation sheet, I put the preterite of the subjunctive (the one that gives the ‘If I were a dog') to the left of the preterite of the indicative (the one that gives the ‘I barked'). Hope my explanations were not too twisted ! As far as the conjugation sheet for Romanian is concerned, I was surprised to see that there are in fact so few tenses to put on it. I already speak the language well, yet I had never realized that ! There are other tenses, but they are formed with an auxiliary in front of the infinitive or the past participle. They are so simple that it's not worth writing them down. 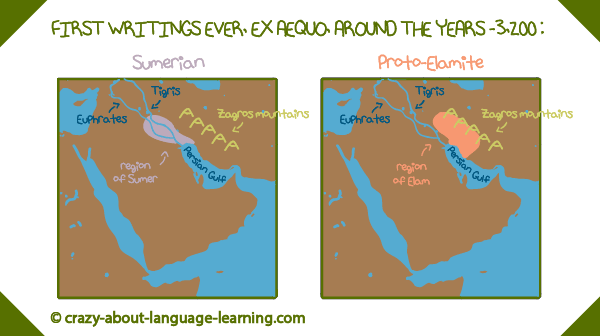 It's enough to learn the auxiliaries since they are the same for all those verbs. You will have noticed that I write my conjugation sheets in block letters rather than with my normal, cursive writing. I find it easier to re-read myself like that. The letters that are the same from one line to the other look “lighter” and the loops of the ‘f' that are written exactly at the same place one line under another one don't superimpose. Is it really necessary to make conjugation sheets ? No, absolutely not ! For example, many of you prefer to listen so as to learn. You then should of course choose the oral method. Read out loud, repeat, etc. What is the most important is to appreciate your moment dedicated to learning a language. Above all, don't bother writing down lines of verbs if it annoys you ! Now, for those who like to learn with the eyes, writing the conjugated verbs down, getting it wrong, having to tear down the page and re-write it all, taking the time to put the tenses in a meaningful order, etc., all this makes you think about the subject … hum … I meant the verb, and hugely helps the memorization process. So, go for it, print your first conjugation sheet right away and come back to tell us your experience in the comments below ! 1 In Portuguese for example, the way to address several people formally but also informally is now expressed with the 3rd person of the plural. Only five lines are thus necessary.